When you think of the key partners a business must have in order to operate, you might overlook the importance of insurance. But at Sustainable Harvest®, the insurance coverage on our coffee as it makes the long journey from origin to destination is a necessary protection. There's a lot that can go wrong when it comes to shipping anything, but green coffee as an agricultural product poses particular challenges. Coffee insurance isn't something you get from the same agents who cover your car, home, or life, Just as in banking, you need special expertise to get the right protection. For many years I've known that one of the best in the field is Ted Rekerdres of Rekerdres & Sons, a family-owned business with whom we've had a a longstanding relationship. Rekerdres & Sons provides our insurance on many items, including the coffee in the hundreds of shipping containers we move globally. Last week I had the pleasure of traveling to Dallas to speak at the Rekerdres Confab—the organization’s annual gathering of insurance underwriters—about the Relationship Coffee Model and the inner workings of the coffee industry. The event had a collaborative spirit, with the different insurance company attendees sharing ideas and engaging in conversation. It had a familiar feel to me, and that makes sense: One of the company’s partners, Ted's son Adam, told us the Confab is inspired by our Let’s Talk Coffee® event. 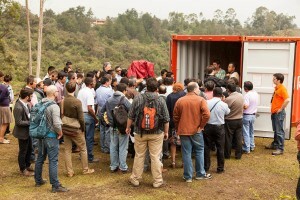 Adam attended our 2012 conference in Colombia, where he led one of the most compelling workshops in Let’s Talk Coffee® history: He suggested we put an empty shipping container on the conference grounds for a training. 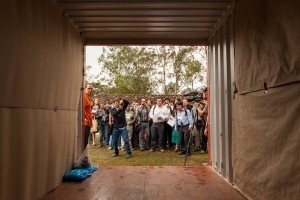 Adam and other industry experts showed the crowd of producers, roasters, financiers, and others the proper ways of “dressing” the container, which takes place prior to loading in the 38,500-pound standard shipment size of green coffee. The memorable workshop succeeded in large part because it illuminated a broad cross section of the coffee industry on a critically important but not often discussed topic that matters a lot to our success as a business. 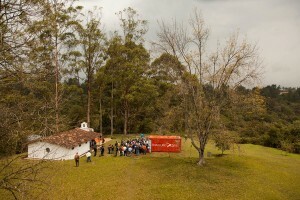 Our logistics team needs strong supplier partners with the right training at origin. The expertise for that training is within our own supply chain, which is the beautiful part about the impact of the community that comes to Let's Talk Coffee® events—there is so much industry knowledge in the room, covering a wide range of coffee issues. After attending Let’s Talk Coffee®, Adam realized that what worked for coffee people in Colombia could be applied to insurance underwriters for his event in Dallas. 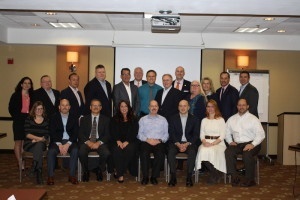 “When I saw in person the energy and enthusiasm generated by bringing together different people in the industry, I knew we could do something similar in insurance,” he said. “Even better, I saw that Let’s Talk Coffee® inspired ideas that reverberated into new relationships and true action." It was great to take part in the Rekerdres Confab, and to see that other industries find value in the collaborative nature of the Let’s Talk Coffee® approach. It makes for good business.